Tonight Steve & Chris speak with Ray, a man of many talents, an American Hero and someone who has encountered the Mapinguari. Ray is a former Airborne Ranger with the United States Army serving predominantly in South America, in such military actions as Operation Just Cause and military actions as an advisor against FARQ. 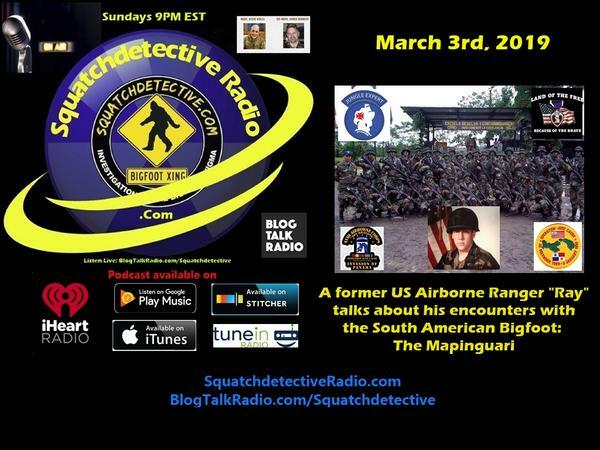 A combat medic, survival expert and a witness to the Bigfoot of South America, the Mapinguari. Ray retired from military service to become an entomologist. Podcast rebroadcast can be found on IHeartRadio, I-Tunes, Google Play Store, Stitcher Radio, TuneIn Radio and of course on BTR.